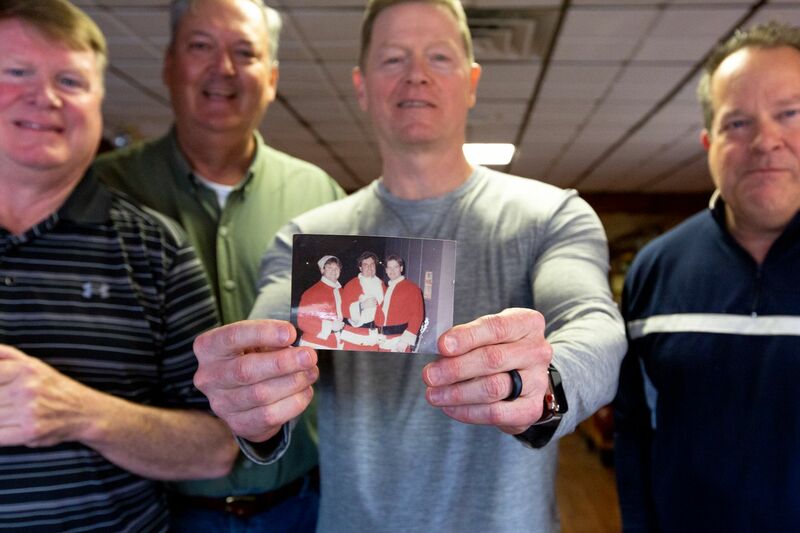 Joe Reichwein holds up a picture of three of the ten men who dressed up in Santa suits for the Sixers game December 12, 1984, while Mike Reichwein (left), Jay Barthelmess (second from left), and Mike Power (right) stand for a portrait while they reunited and reminisced at Chalfont Family Restaurant in Chalfont, PA, Saturday, March 16, 2019. This year is the 35th anniversary of the notable event, "The night Santas fought back". Brace yourselves, Philly sports fans: this morning we’re adding another crazy anecdote to your mythology. Forget snowballs and batteries. Columnist Mike Sielski wants to remind you of the time Santa threw some punches at a Sixers game. Multiple Santas, actually. Trust me, you’re going to want the full story. It’s hard to follow that up, I’ll admit, but this morning we’re also digging into what a Princeton data broker is doing with data on over 1 million high school students. The story of Eagles fans pelting Santa with snowballs in 1968 is too often trotted out as a symbol of Philadelphia sports fandom. But one special night in 1984, Santa fought back. Nine Santas, actually. It’s been 35 years since costumed men got involved in a brawl with several Celtics fans during a game. Columnist Mike Sielski sat down with them to get the full story once and for all. The 2019 Sixers, meanwhile, play the Hornets tonight before their next rematch with the Celtics Wednesday. Last year, Vermont passed the nation’s first law governing the data mining industry. They now require data brokers to register with the state and disclose whether they posses data on minors. A Princeton-based company told Vermont regulators it didn’t knowingly posses data on minors. Meanwhile, on its website, it advertised a mailing list of more than a million high school students for sale with names, addresses, high schools, and hobbies of students aged 14 to 17. New Jersey authorities announced Monday the arrests of 12 men in what was termed a “criminal network” in Camden County allegedly trafficking in untraceable, build-it-yourself AR-15 assault rifles. The Attorney General’s Office and New Jersey State Police said the investigation began as a probe of cocaine distribution centered in Lindenwold and broadened to include guns. The men are the first to be arrested under a new state law criminalizing the use of “ghost guns” built from kits sold online. Pennsylvania State Rep. Brian Ellis resigned Monday, six days after a woman accusing him of sexual assault filed a formal complaint with the majority House Republicans. More than 100 people joined a rally in Cape May Monday to protest a Trump administration plan to allow seismic testing, which researchers have said could harm marine animals, to look for oil and gas in the ocean. Former U.S. Rep. Chaka Fattah won’t be appealing his conviction for corruption-related crimes to the Supreme Court; it denied his petition Monday. New Jersey has joined Philadelphia in its ban of cashless stores, with a few exceptions. Gov. Phil Murphy signed the ban into law Monday. An investigation is underway after a viral video showed a Chester police officer striking a woman in the face Saturday with what appears to be a weapon. More than 1,000 people are feared dead after a cyclone slammed Mozambique, submerging entire villages. Is that you, spring? 😍 Great flower spotting, @jeffphl. Attention, Broadway babies: Dear Evan Hansen, Mean Girls, and The Spongebob Musical are on their way to Philly. You may not be too familiar with Belmont University, but that doesn’t mean they can’t boot Temple from the NCAA Tournament tonight in Ohio. We’re serving up another edition of Clean Plates. This time health inspectors closing local eateries found AstroTurf-lined shelves, dirty coffee pots, and pink slime. Your new neighbors might be gone in a flash as apartments in Center City are converted to ersatz hotel rooms thanks to hospitality startups. Having trouble falling asleep? You’ll find company (but maybe not extra Zs) in YouTube’s sleep meditation chats. Former Phillie Carlos Santana may have smashed up a TV last year as the team’s playoff hopes dissolved, but Phillies players dispute that they were playing video games during a game. “Our previous research has found that, while white people are rarely asked questions like ‘What have you done to prevent this cancer of white extremism?’ non-Muslims in American and Europe readily blame Muslims for similar acts of violence by individual extremists.” — Dr. Emile Bruneau asks how can we stop anti-Muslim bias that blames an entire culture for individual acts? The City of Philadelphia needs a centralized process for handling sexual misconduct claims, writes Philadelphia City Controller Rebecca Rhynhart. New Zealand’s response to the massacre at two Christchurch mosques last week — their prime minister promised changes to its gun laws within days — puts America to shame, writes the Inquirer Editorial Board. Delaware vocational-technical students are racking up scholarships and apprenticeships, WHYY reports. Their experiences point to a shift in education at large. If you’ve ever spent a morning singing in the shower you know that music affects your brain, but how? Let Wired’s fun new video on the topic explain. The old Wirt & Knox Manufacturing Co. headquarters still looms over Sedgley Avenue in Strawberry Mansion but little is known about its history — besides what Hidden Philly uncovered, that is. In the wake of the college admissions scandal rocking higher education, the Atlantic has taken a look at how low-income students are treated like they don’t belong at elite institutions. Syphilis Skull (aka Syphilitic Caries) at the Mutter Museum in Philadelphia, Monday March 18, 2019. The Mutter Museum is known for its huge colon, Einstein’s brain, and a plaster cast of conjoined twins. But its less infamous items are every bit as visit-worthy.